. . . [The Republicans’ differences with the White House do] not rise to the high crime and misdemeanor level. Read the Washington Post, Paul Ryan just nailed the impeachment question. UPDATE VIII: Republi-cons have been asking for impeachment since early 2009, soon after Obama took office. Read the Washington Post, Impeachment talk is back. Here’s a timeline of how we got here. Again. UPDATE VII: "Politically, the Boehner suit is a fool’s errand because it won’t do what he wants it do. Rather than tamp down talk of impeaching Obama, it will lead to an increased clamor for it. Yeah, Boehner said, “I disagree” when asked about Sarah Palin’s impeachment blabber. But, look, Boehner’s caucus is filled with folks who have wanted to punish the president for various and sundry “offenses” since at least 2010." Read the Washington Post, Boehner’s ‘political stunt’ will lead to Obama’s impeachment. UPDATE VI: "Okay -- so, who's talking about impeachment? People who want to build lists and raise money. No one is floating this idea unless it's attached to an ask. As Erik Wemple reported, the reason Palin's column did not appear at Fox News -- the reason Breitbart scooped it -- was that it was shopped by SarahPAC." Read Slate, "Impeaching Obama" is Just a Fundraising Gimmick (for Now). And remember, it's been more than three months since Birther Fool's Day, Bwahahahaha!!!! UPDATE V: "Speaker of the House John Boehner (R-Ohio) said today that he plans to sue President Obama for violating the United States Constitution with what Boehner called 'his outrageous practice of accomplishing things.' . .
Ripping the President for his 'willful insistence on doing things,' Speaker Boehner said that his lawsuit was intended 'to restore the inaction and inertia that have been the hallmarks of our democracy.'" Read The New Yorker, Boehner Calls Obama’s Practice of Accomplishing Things Unconstitutional. 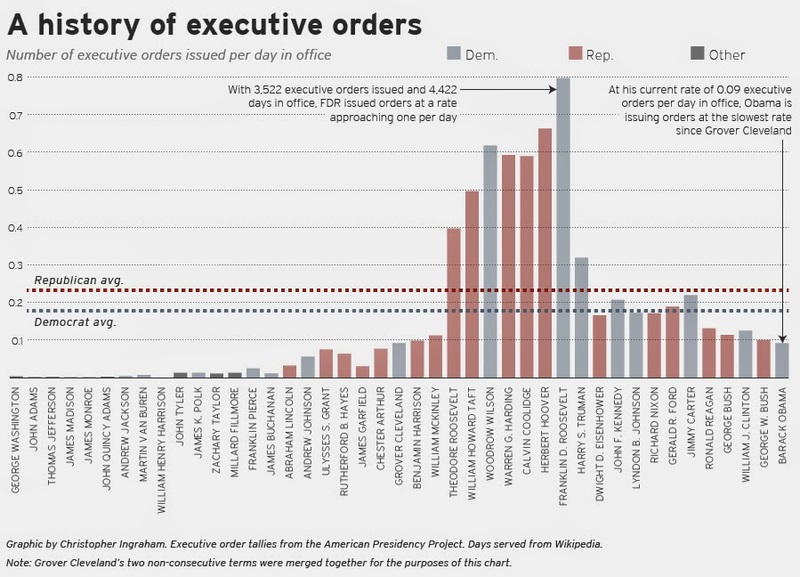 UPDATE IV: "The graphic below shows the frequency with which presidents have issued executive orders. Republicans are right: President Obama is absolutely unique…in how infrequently he issues them! The last president to issue executive orders at such a slow rate was Grover Cleveland who served from 1885-1889 & 1893-1897. What’s more, Republican complaints about President Obama’s use of such powers is a bit ironic, given historically Republican presidents use executive orders more frequently." Read The Brookings Institution, Obama's Executive Orders; A Reality Check. UPDATE III: "After going out on a not-so-wobbly limb to suggest that Republicans would push to impeach President Obama if they succeeded in retaking the Senate, George Will’s Sunday column read like a real threat. . .
I’d be a little more sympathetic and understanding if I didn’t know that Republicans had it in for Obama before he stepped into the Oval Office on Jan. 20, 2009. Michael Grunwald’s book, released in August 2012, added new information that extends the timeline of Republican recalcitrance. The Post’s Greg Sargent found the ah-ha paragraphs on page 207. Biden says that during the transition, he was warned not to expect any cooperation on many votes. 'I spoke to seven different Republican Senators, who said, `Joe, I’m not going to be able to help you on anything,' he recalls. His informants said McConnell had demanded unified resistance. 'The way it was characterized to me was: `For the next two years, we can’t let you succeed in anything. That’s our ticket to coming back,'" Biden says. The plan all along has been to crash the Obama agenda and then climb on top of the wreckage and seize power. Not only are Republicans complicit in the 'failures' they rail against, but they are also the reason the president has had to resort to executive action to get some things done. Even Will agrees Obama is within his authority to do this. He just doesn’t like the degree to which he has done it. Poor dear." Read the Washington Post, Speaker Boehner’s Obama impeachment dress rehearsal. UPDATE II: "George W. Bush is conspicuously absent . . . from every Republican discussion of impeachment. As he must be. If Bush enters the conversation, then McCarthy and company must explain why his administration didn’t meet the conditions of 'high crimes and misdemeanors': why Fast and Furious is impeachable but Operation Wide Receiver, its predecessor, was not; why 'the willful misleading of the American people' and 'the provision of false information to Congress' about an anti-Islamic video is a dereliction of duty but doing the same about weapons of mass destruction in Iraq is not; and on and on. Only by making a convincing case on those issues can Republicans demonstrate theirs is a principled rather than partisan position." Read U.S. News and World Report, Not Serious. UPDATE : More empty talk of impeachment. Read The New York Times, Ignoring Qualms, Some Republicans Nurture Dreams of Impeaching Obama and Time, The Escalating GOP Call to Impeach Obama. No, with all that empty talk of impeachment, I triple-dog-dare the Republi-CONs to impeach Obama. Read Businessweek, Why the GOP Might Try to Impeach Obama Over Benghazi and Huffington Post, Impeach the President!... But Make It Quick. But beware the blowback. Read the grio, Why no one takes impeaching Obama seriously.